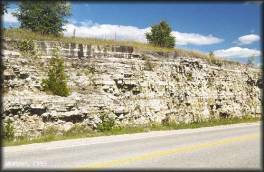 560 million year old Nepean sandstone was quarried off Highway 417 near Kanata. Garson, Manitoba provided dolomitic limestone with attractive fossils for Parliament’s interior walls. Four Peace Tower gargoyles are of Stanstead grey granite from Beebe, Quebec. Find this grey-blue marble in an East Block fireplace. 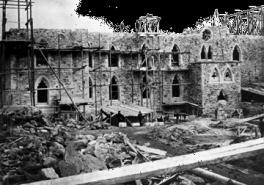 December 1859. The first wave of construction workers occupied the Barrack’s Hill encampment. Shifts from 5am to 8pm, with half hour lunch and dinner breaks. Excess hours increase the accident risk. Blasting was common. In May 1860 a four to five hundred pound stone was hurled over eight hundred feet into the air. It landed near a group of visitors. August 1861. Mason Charles Devlin fell 24 feet from the West Block. He later died from internal injuries. Other falling fatalities followed. Unsafe conditions led to several strikes. But organizing was difficult; unions were illegal. 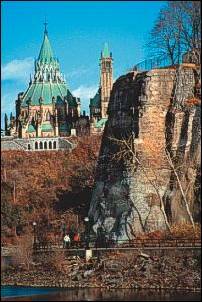 Parliament Hill workers still have worse health and safety protection than other workers. In 1867 an unskilled day labourer, fortunate enough to have work, earned a dollar a day for a 10-hour day, six days a week. A highly skilled craftsperson might earn $3.00 a day. Women and children were very poorly paid. A woman earned half a man’s wages, perhaps 35 to 60 cents a day. A child might earn no more than 25 cents for a full day’s work. Very few employers provided for workers who were ill or too old to work. The sick and elderly with no savings had to rely on help from family, friends, or charities such as churches. Unions were illegal, but worker’s self-help groups provided sickness and funeral benefits to members. Labour laws favoured employers even more than they do today. Until 1877 courts could send disobedient or absentee workers to jail at an employer’s request. Reference: Desmond Morton, Working people: an illustrated history of the Canadian labour movement.